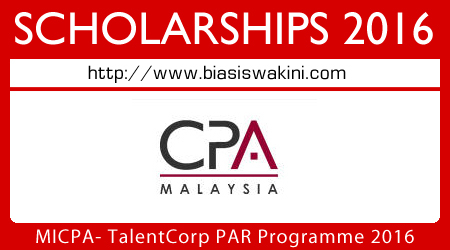 MICPA and TalentCorp jointly offer a scholarship 2016 which enables accounting undergraduates to embark on the highly-regarded MICPA-CAANZ Programme in their 4th year of study. This Programme leads to a dual qualification from MICPA and Chartered Accountants Australia & New Zealand (CAANZ) which entitles graduates to use both the CPA(M) and CA(ANZ) designations. 0 Komentar untuk "MICPA and TalentCorp PAR Excellence Programme 2016"